A chance encounter brought Katalin Toth to Mizzou. The postdoctoral fellow, first heard about MU when Gary Stacey visited University of Munich. Toth heard of a position opening up in his lab. She has now been in the Stacey Lab for six years. Science has led Toth from the mountains of Slovakia where she did her masters to Hungary for her Ph.D. and Germany for research. Missouri ended up being the next step in her journey. Being a foreign postdoc in the lab gives Toth a unique perspective. 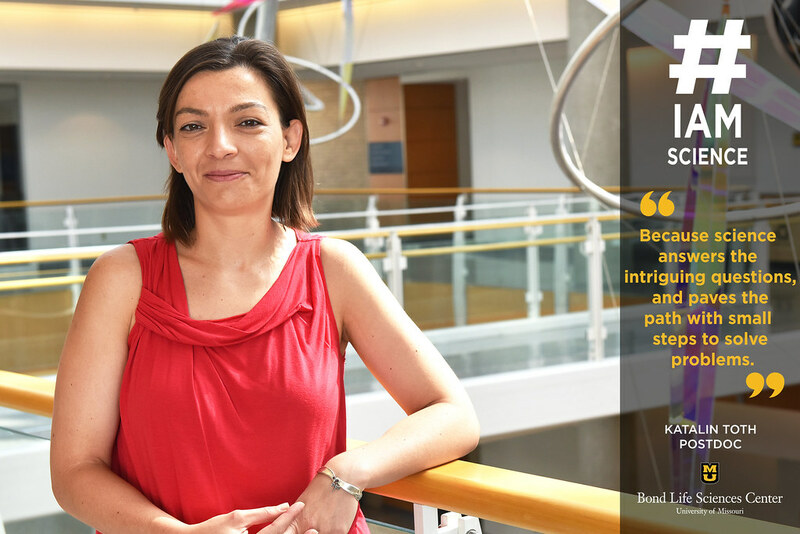 She has seen two different research environments — one in Europe and the other here —that highlight cultural and experimental differences. Toth has always been given opportunities in the labs she has worked at, but as a postdoc she now has a chance to express her love for science to others. Toth’s love for science sprouts from the exploration of soybean research and how it will affect our world and other cultures. Currently, she is studying soybean association with beneficial soil bacteria that help soybeans to better access nutrients such as nitrogen, vital for a crop’s growth. Toth’s travels have also opened up her perspective on different culture’s needs. Toth has done research for 10 years, and doesn’t want to stop anytime soon. From long hours at the lab to even weekends of research, Toth is always eager. “Everyday there is something more exciting,” Toth said. As busy as she is, Toth has always found time to enjoy her favorite place: outdoors. However, there is only one slight fall back from her move to Missouri. “I just do not like the hot summers here,” Toth said.